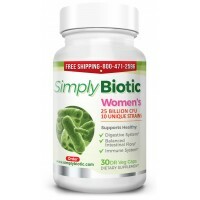 Each bottle of Simply Biotic contains 30 vegetable “DR” Capsules (Delayed Release). This allows for the capsules to bypass the acid in the stomach and populate the small and large bowel with the beneficial bacterias. The capsules contain no milk, no wheat or soy product. The capsules are shelf stable, and do not need to be refrigerated. All these features make Simply Biotic one of the best on the market. 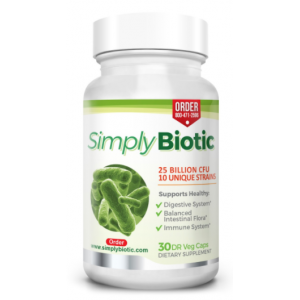 Simply Biotic is beneficial in reducing GI symptoms of bloating, diarrhea, constipation, and abdominal pain. We recommend Simply Biotic to patients with less than 2 gastrointestinal problems and first time users. Our experience with Simply Biotic has been amazing. Every day we hear stories of our patients being symptom free and able to carry on normal lives. Love this. I have been using it for 4 weeks now and I no longer have stomach noises and have reduced my gas issues by at least 70%. I’m thrilled with to find this product as friend recommended it to me. Now my whole family takes it. Great stuff. I started doing research on Probiotics about 4 months ago and came across this product in my doctor’s office. I thought I'd give it a try because it is made by a Gastroenterologist. It really helped me right away. As a beginner in probiotic, I was unsure of what effect this would have on my GI health, and mood. I will say that it has tremendously helped me with more energy levels and getting rid of stomach issues like gas, bloating, cramps and irregular bowel movement. I try to take it every day. I have been using probiotics from different manufacturers, including some big names for over three years with a varied range of not so good results. I was given a free sample from my doctor’s office. This Probiotic is absolutely amazing and has lived up to its claims to relieve my digestive issues. I recommend this product to all my friends and acquaintances all the time. I have chronic constipation issues, and have been seeing Dr. Malhotra for a long time. My life has been better after I started taking linzess but however still had issues with bloating and cramping. He had me try his new probiotic which has worked well for me. It has cleared all the gas and cramps. Best of all, some of the days I do not have to use the medication to go since Simply Biotic has even regulated my bowel movements. Amazing product!! YES! I love this product! I am so regular and not struggling to fit into my jeans because of my bloated belly. I'm feeling amazing after using this product. Incredible job by the doc who created it!